An Indian women no matter which part of the India or world she is in will always look her best in Indian Ethnic Wear only. Indian women's prefer wearing saree when it comes to social gatherings. It is also referred as a Sariz, Sareez, Said, Shadi saaree and Shari. Generally saree consists of a 5.5 meters (6 yards / Gaj) to 9 Meters of fabric. There are various styles of draping popular in different states and each one gives a unique look. The various number of fabrics such as silk, cotton, brocade and Georgette go into the making. The work can be either embroidered or printed or both. There are different processes and ways to enhance the beauty of the saree. Those are sequins, patch, butta, stones, mirror work and zari. One should consider the season at the time of buying of saree. 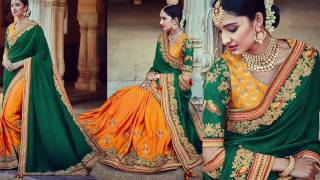 Shopping Sarees Online is now the easiest way to buy desired stuff that you are planning to wear it. You should consider the property of fabric at the time of buying. Every fabric has its own property and it depends on the property of its raw materials. Nylon and polyester are suitable to wear during winter. Natural yarns like cotton and viscose / rayon will be more comfortable in summer. One must wear a sari made from the cotton fabric during summer time. It is a preferred choice as it soaks the sweat and being a lighter fabric there is hardly any sweat. Nowadays many a variety of fabrics has seen an increase in demand. For monsoon season, you can also buy silk, Georgette or chiffon Sarees online. These kind of fabrics are suitable because if you get wet in rains they dry up pretty quick. 1.) Silk Saarees: Luster is a primary property of silk fabric. It gives a look that is more glamorous than any other fabric. It resembles the symbol of royalty and is preferable for big functions such as marriages. It is mostly preferred by women's of south India. There are 2 main centers which produce silk sarees. Banglori silk is produced in the southern part of India and banarasi silk in northern India. These Outfits represent a form of Indian traditional Sarees style. 2.) Banarasi: This is specially made of various beautifully woven patterns called jacquard silk fabric. It is a traditional Moghul pattern found in Varanasi / Banaras area known as a Banaras Sari. Style Tip: Go for a Silk Saaree made of golden, maroon or green color. Beautify it with a matching sleeveless blouse and a golden clutch. 3.) Chiffon Saarees: As compared to the silk fabric it is much lighter in weight and is mostly preferred for a get-together. It gives a touch of elegance making it suitable for the evenings also known as kitty parties. The touch and feel of this fabric are soft and smooth making it suitable as an evening party Saree giving a slimmer look to the wearer. 4.) Georgette Sarees: Georgette has quite a few similarities with chiffon. In fact, it originally made from silk having a much dull finish. And it also lacks the luster that is found in chiffon. Style Tip: Go for a magenta Georgette Sari. Pair it up with a deep neck blouse which can be green, silver, royal blue or yellow. A perfect match of bangles and earrings will beautify the outfit and make you look stunning. 5.) Bandhni: Bandhni also referred to as Bandhej. It is limited to only Rajasthan and Gujarat. It is manufactured in natural or dark colors giving a sparkling look to the wearer. Style Tip: Team it up with a solid blouse available in either black or white, and add up a contrast tote. It will lift up your mood during the summer season. 6.) Chanderi: It is especially made in Madhya Pradesh. The printing pattern name is chanderi and is also referred to as chanderi Sari. 7.) Maheswari: This is another type of special design from Madhya Pradesh State. 8.) Kosa: Kosa is a special kind of silk produced in Chhattisgarh state and that’s why the name given kosa Sari. 9.) Samblpuri: This is a Traditional Indian Sari blouse design which originated in Orissa. It is made using silk or cotton. It is especially designed with shell wheel and flower called shanka, chakra, phula. 10.) Ikkat: Ikkat is a unique and traditional dying and tying style of Orissa. It is popular in neighbor states too. 11.) Tangail: Tangail is a type of special cotton weaved in Bengal State and Bangladesh. Hence it is famous by the name Tangail Saaree. 12.) Jamdani: This high neck Saree blouse design is a traditional bridal wears of Bangladesh. This style is a symbol of prosperity in Bangladesh. 14.) Tant: Tant is a type of Hand woven cotton fabric mainly weaved in west Bengal. It is regular wear Saree of Bengali women. They wrap it in such a different manner without blouse. 15.) Tussar silk: This variation of silk is produced in Bihar Tussar Saaree made out of that silk yarn. 16.) Mooga: This is a special type of silk produced in Assam, The product made out of this silk are called Mooga. Various type of patterns of collar Saree blouse designs are known with this name. 17.) Dhaniakhali: Fabric produced in west Bengal on hand-looms consuming cotton Yarn. 18.) Kantha: This is a special kind of stitching style called kantha invented in west Bengal. It is produced from silk and cotton fabric, popular for long sleeve Saree blouse designs. 19.) Ponchampaaly: This princess cut Saree blouse designs is fashioned with ikkat dying in Andhra-Pradesh. It is also a popular design in AP. 20.) Venkatgiri: It is known for its famous zari work and considered as bridal wears in Andhra Pradesh. 21.) Gadwal: This is famous zari work Saree produced In Gadwal district. 22.) Puttapaka: This style made in the Putta-paka village of Andhra Pradesh state. Puttapaka. Saaree has become a popular brand because of with its producing town name. This special sari is made mainly in South India especially Tamilnadu. Some weavers in a small town named Anakaputhur make it using the extract that is produced from banana tree trunk. The process of making one is not simple and required some hard work to be carried out. In the first stage, simple bleaching method is used to wash the raw fibre. In the second stage, each filament is then dyed and weaved back together. The best thing about it is the cooling effect that it provides. Currently, its market rate is as low as Rs. 500 that leads to a heavy demand. However, there is always scarcity in the market due to less number of manufacturers. Something that is very easily accessible and promotes green mission are the jute saris. It is often mixed with various fabrics like silk or cotton which makes them more durable and also softer. One of the best qualities being it absorbs moisture. This makes it suitable to wear during summers. Currently, they are available in bulk only in Varanasi. As the name suggests the sari here is made from sugarcane. In this type, the juice is first extracted from sugarcane and the leftover, pulp or bagasse is then used to produce the required fiber. The making of this style is complex and thus they are sold at higher price. It gives a lustrous effect that sets it apart from other eco-friendly ones. We are sure after reading this you would have got a very good idea of the diverse patterns available in India depending on the region, fabric, style etc. You will find something for everyone here so do browse our collection and in case you do not get what you are looking for then contact us.